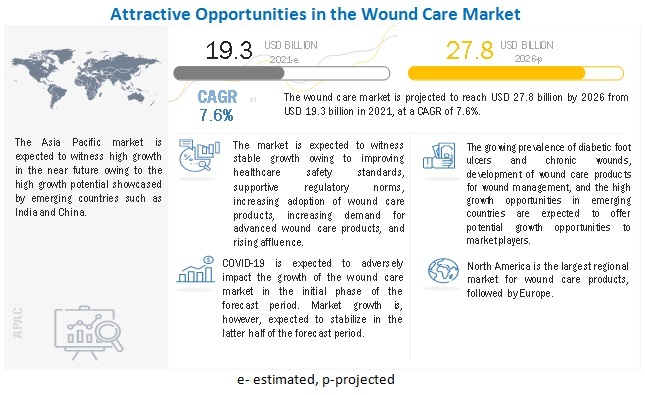 [319 Pages Report] The wound care market is expected to reach USD 22.81 billion by 2022 from USD 18.99 billion in 2018 at a CAGR of 3.7%. The base year for this study is 2017 and the forecast period includes 2018-2023. Advanced wound care products are designed to cure and treat complex wounds, such as diabetic foot ulcers, venous ulcers, and pressure ulcers. Advanced wound management is based on the principle of moisture therapy. In advanced wound management, moisture is provided to the wound site to allow cells to heal and repair naturally. The rising incidence of hard-to-heal wounds and their growing adoption (due to their high efficacy) are driving the growth of this product segment. The base year considered for the study is 2017, and the forecast has been provided for the period between 2018 and 2023. This research study involved the use of extensive secondary sources, directories, and databases, such as Hoover’s Inc., Bloomberg Business, Factiva, and Avention, to identify and collect information useful for this technical, market-oriented, and commercial study of the wound care market. The primary sources were mainly industry experts from the core and related industries and preferred suppliers, manufacturers, distributors, reimbursement providers, technology developers, and organizations related to all segments of this industry’s value chain. In-depth interviews were conducted with various primary respondents, including key industry participants, subject-matter experts (SMEs), C-level executives of key market players, and industry consultants, to obtain and verify critical qualitative and quantitative information and assess prospects. Major players in the wound care market include Smith & Nephew plc. (UK); Acelity L.P. Inc. (US); ConvaTec Group Plc. (UK); 3M Company (US); Ethicon (US); Mölnlycke Health Care AB (Sweden); Covidien plc (Ireland); Coloplast A/S (Ireland); Baxter International Inc. (US); Derma Sciences, Inc. (US); and Hollister Incorporated (US). In July 2018, Acelity launched ABTHERA ADVANCE, an open abdomen dressing in US. Smith & Nephew in 2018, launched PICO 7 in Europe in order to strengthen its position in European wound care market. The global wound care market is expected to reach USD 22.81 billion by 2022 from USD 18.35 billion in 2017, at a CAGR of 3.7%. The global wound care market is segmented by product, wound type, end user and regions. By product type, the wound care market is segmented into advanced wound management products, surgical wound care products, and traditional wound care products. The advanced wound management products segment is estimated to account for the largest market share of the global wound care market in 2017. Factors driving the growth of this segment include the increasing incidence of diabetes and rising demand for innovative & advanced wound management products. By wound type, the market is classified into chronic wounds and acute wounds. The chronic wounds segment is estimated to account for the largest share of the global wound care market. The large share of this segment can be attributed to the rising incidence of diabetic foot ulcers, pressure ulcers, and other types of chronic wounds. 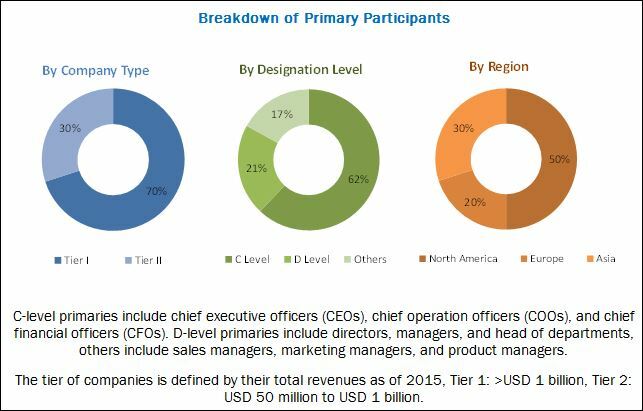 On the basis of end user, the wound care market is segmented into hospitals and specialty wound care clinics, long-term care facilities, and home healthcare. The hospitals and specialty wound care clinics segment is estimated to account for the largest share of the global wound care market. Increase in the number of chronic wound cases, rising incidence of diabetes, and improving hospital infrastructure in developing countries are some of the major factors driving the growth of this end-user segment. In 2017,the global wound care market is dominated by North America, followed by Europe. North America will continue to dominate the global wound care market in the forecast period. However, Asia Pacific is expected to witness the highest CAGR, with the growth in this market centred at Japan, China, and India. Factors such as the rising focus of major players in emerging Asian countries and government support are driving the growth of the wound care market in this region. Diabetic foot ulcers are a serious complication of diabetes and often lead to deformities of the lower extremity or amputation of the leg. Foot ulcers usually occur when there is nerve damage (termed neuropathy). As the nerves are affected, the patient’s ability to feel pain, heat, and cold is reduced, resulting in ulcer formation. Apart from nerve damage, Charcot neuropathic osteoarthropathy (CN) is a primary risk factor. This affects the bones, joints, foot, ankles, and soft tissues in the early phase. A pressure ulcer is an area of damage to the skin and underlying tissue that is caused by unrelieved pressure, friction, and/or shear forces. A severe ulcer is susceptible to infection and may be life-threatening. The costs associated with pressure ulcers are considerable. According to the Agency for Healthcare Research & Quality (AHRQ), pressure ulcers cost the US healthcare system an estimated USD 9.10–USD 11.60 billion each year. The cost of treating a pressure ulcer depends on its severity, with estimates generally ranging from USD 2,000–USD 20,000 per ulcer. Leg ulceration is commonly caused by venous hypertension resulting from valvular incompetence in superficial, deep, or perforating veins. Sustained venous hypertension causes swelling, restricted blood flow, and damage to the skin and other tissues. Venous disease (~80%) and arterial disease (~15%) are two of the major causes of venous leg ulcers. The incidence of leg ulcers is increasing as a result of the rising geriatric population and growing risk factors for atherosclerotic occlusion due to smoking, obesity, and diabetes. The growing incidence of leg ulcers will subsequently drive the market for wound care products used for their treatment. What are the upcoming industry applications for Wound Care? *Top 25 Companies Analysed for This Study are - Acelity L.P. Inc. (US), Smith & Nephew PLC (UK), Mölnlycke Health Care AB (Sweden), Convatec Group PLC (UK), Baxter International Inc. (US), Coloplast A/S (Denmark), Bsn Medical GmbH (Germany), Organogenesis Inc. (US), Deroyal Industries, Inc.(US), Ionmed (Israel), Ethicon, Inc. (US), Medtronic PLC (Ireland), 3M Company (US), Hill-Rom Holdings, Inc. (US), Paul Hartmann AG (Germany), Novabay Pharmaceuticals, Inc. (US), Derma Sciences, Inc. (US), Vivostat A/S (Denmark), Wound Care Technologies, Inc. (US), Leap Therapeutics Inc. (US), Hematris Wound Care GmbH (Germany), Alliqua Biomedical, Inc. (US), Layerbio Inc. (US) Triage Meditech Pvt. Ltd (India), and Fidia Pharma USA Inc. (US). *Details on Overview, Strength of Product Portfolio Business Strategy Excellence Products Offering, Recent Development’s, Business Strategy Might Not Be Captured in Case of Unlisted Companies.